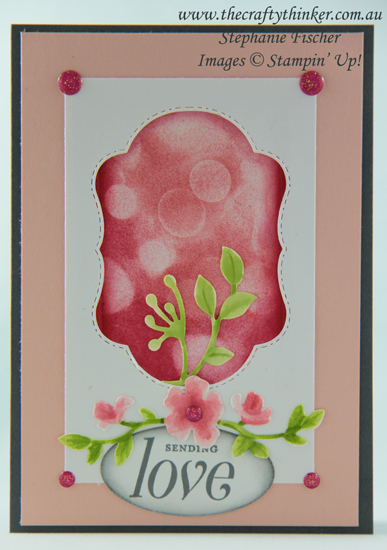 This is the second time I've used the Bokeh Dots stamp set - you can see the first card here. It's one of Stampin' Up's new Distinktive stamps. This time, I inked it up all over with Calypso Coral and then gently added some Poppy Parade in one corner with a sponge brayer. I cut the Petal Pink and Whisper White layers to fit the Basic Gray card base and then used one of the Stitched Seasons frames to cut a piece from the white layer. These frames are really versatile as they leave a stitched pattern on both the label shape and the remaining outline shape. To overcome the fact that the Bokeh Dots is just a tad narrower than the widest parts of the label shape, I cut another frame from a piece of scrap paper, positioned it as I wanted the final piece to look and sponged all around the inside of the frame with Real Red ink, paying particular attention to the problem areas. I cut the floral and foliage elements from plain Whisper White cardstock and then used a damp brush and ink to colour them with Calypso Coral and Granny Apple Green inks. The greeting is from the Floral Frames stamp set. I stamped it onto Whisper White cardstock with Basic Gray ink, cut it out with one of the Layering Ovals dies and then sponged the edge with Basic Gray ink. The final touch was to add some of the Glitter Enamel Dots.